My dog, Chance, enjoys many things, but when it comes to giving him a bath, he might as well be a cat. I could have a YouTube channel dedicated entirely to my struggle to get this dog in even a puddle of water, much less a bathtub or shower. Sadly, no shampoo on this green earth will ever change that for me, but some shampoos can take care of his skin problems and keep his fur looking shiny and healthy. Although, truth be told, that was a struggle for some time, too. In the past, I’ve usually settled on soaps with oatmeal in them as they help to soothe his irritated skin. This is the first time I’ve broken from that habit, and the results satisfied me far more than I anticipated. 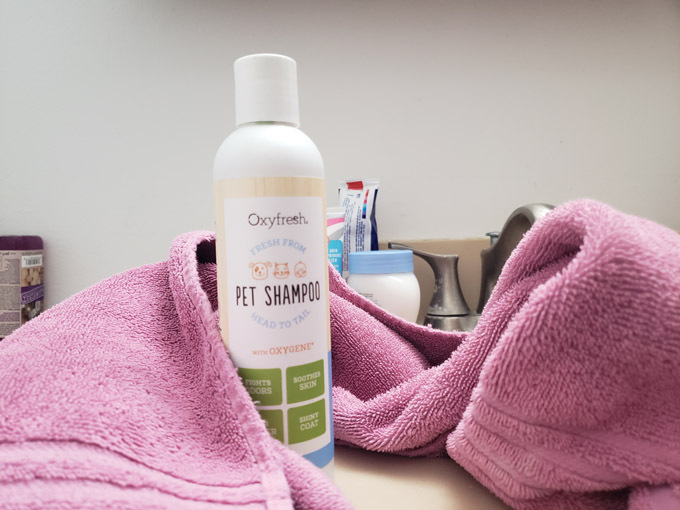 I had the opportunity to review Oxyfresh Pet Shampoo, and here’s how it went. Oxyfresh designed their Pet Shampoo to adhere to the company’s culture and uphold the same standards it sets for the rest of its products. This means that the shampoo is dye-free, cruelty-free, and alcohol-free with essential oils, and is pH balanced to ensure maximum comfort for your pet. Oxyfresh designed the Oxygene formula used for this shampoo to eliminate multiple odors, including that of skunks! I’m not going to let Chance get skunked to test that out, but maybe you can try if your pup has a skunk encounter. Each of these products also comes backed with veterinarian guarantees that both you and your pet will be satisfied with the end result. I gave Chance two baths with this shampoo. I limited my time with it because winter has most definitely arrived here in the midwest, and I don’t want to risk drying his skin out any more than it already is. 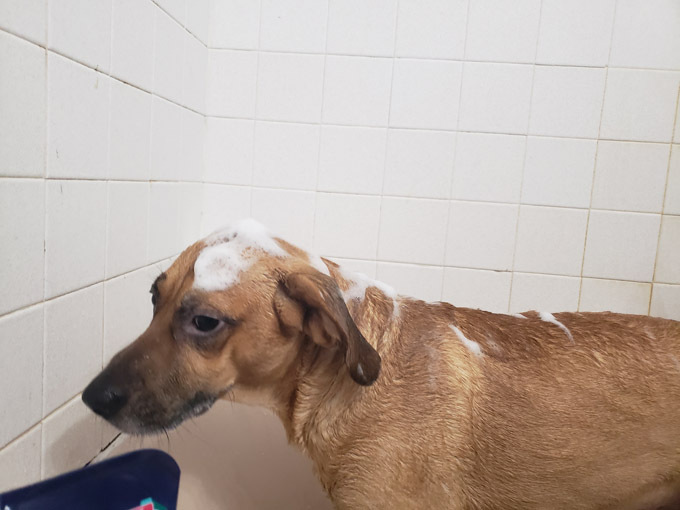 While neither experience was terribly pleasant for Chance–he will start to reenact the Sarah McLachlan commercials in a heartbeat the second he sees running water for any length of time–I have to say I appreciated the quality of the shampoo. 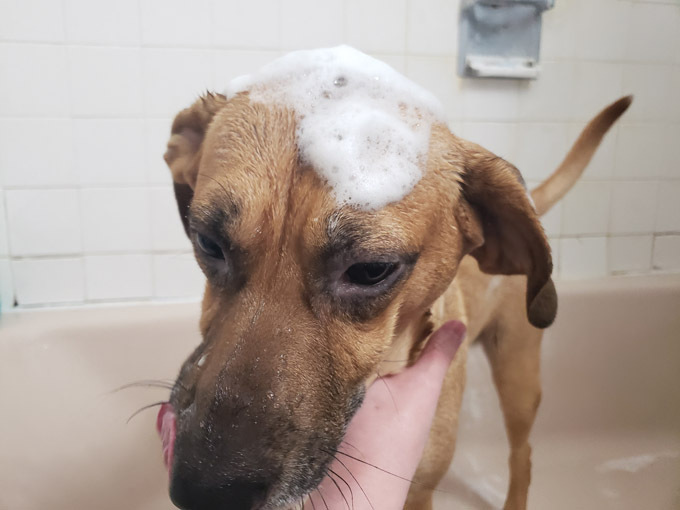 Most of the pet shampoos I have used in the past don’t have much of a lather, and while that’s not the most important factor of a shampoo, it does make you at least feel like your pet is going to be cleaner. I am also a big fan of the smell–a slightly minty scent that isn’t overpowering and lingers for only a short while on the fur afterward. The shampoo also rinses off easily, not leaving any unpleasant residue afterward. His fur has maintained a beautiful sheen for days after the fact and still felt soft to the touch for the same duration of time. Overall, I am quite a fan of Oxyfresh Pet Shampoo, and would definitely recommend it if you are in the market for a more humane option in your pet cleaning products.